Cherokee Manufacturing can produce turbidity barriers (often known as floatation silt curtain) to meet any specification or site condition that is encountered. With materials both pervious and impervious, as well as a full implement of marine rigging and anchor options, we can create barriers that will be both resilient and maintenance free for nearly any application. Turbidity Barriers are designed to restrict the flow of sediment-laden storm water runoff from a construction site, to keep it contained in a limited area, and allow the sediment to settle out before being carried into adjacent or joining watercourses. 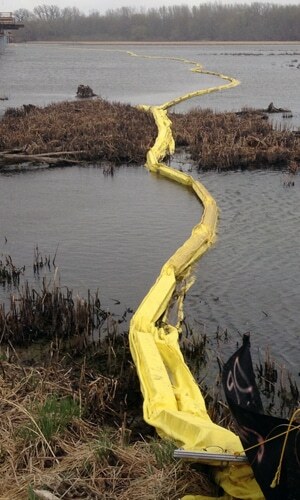 Floating Turbidity Barriers consist of a top flotation boom, an impervious fabric curtain extending downward under water, and a heavy galvanized steel chain sealed into a hem along the entire bottom of the curtain to provide ballast to keep the curtain vertical in the water. End hems are sealed around a rope and grommeted to allow attachment to each other with rope or bolt/nuts/washers. of 50 ft. Standard depths are 3′, 5′ and 10′. Custom lengths (up to 100′) and depths (from 2′ to 100′) as well as custom colors and accessories (such as lighted navigation buoys and anchor kits) are also available. Type 1 DOT Turbidity Barriers are manufactured to meet DOT requirements to be deployed in water with little to no flow rates. Made from 18 oz PVC coated material making them durable and economical. 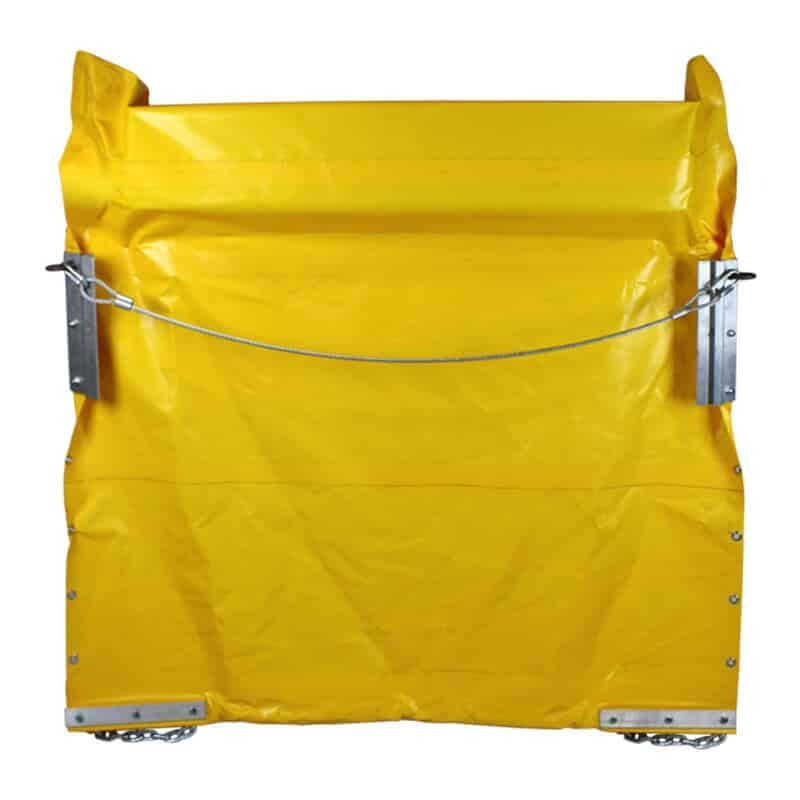 The Type 1 barrier is recommended for construction sites located in protected areas that are exposed only to light winds and to current velocities of less than one foot per second. This type of site may include ponds, shallow lakes, small streams and marshes. Standard size is 5′ depth. Custom sizes are available. Type 2 DOT Turbidity Barriers are stronger overall to allow for deployment in waters with higher flow rates. These barriers have top load cables, stress plates for reinforcing the corners, and 12″ ASTM Universal connector plates used to connect one section to another. They are designed to handle more severe conditions such as lakes, streams, inter coastal and tidal areas where current velocities up to 5 ft per second are expected. Type 3.DOT is a special adaption of the Type 2 barrier. Approximately 20% of the area of the barrier skirt fabric is replaced with a polypropylene filter fabric conforming to some State DOT specifications. The filter fabric is inserted to reduce the pressure on the curtain while retaining silt. In actual practice, a filter fabric which is woven tightly enough to retain silt will not significantly reduce pressure on the curtain. Conversely, if the filter fabric is woven loose enough to reduce the pressure on the curtain, it will not be able to retain most silt and sediment particles. In addition, the filter fabric cannot be heat-sealed, and must be sewn into the curtain, resulting in a reduction in curtain strength and longevity. These are the strongest floating barrier for silt and turbidity control and are designed for fast water, waves or other demanding conditions. They are typically recommended for areas with flows up to 1.5 knots.